3 How to Do Hair Like Audrey Hepburn in "Breakfast at Tiffany's"
An updo doesn't have to be complicated, especially when in the form of the user-friendly bun. These twisted styles work for countless occasions, from running errands during the day, to grabbing a few drinks at nights. All you need are a few minutes and a few tools and your hair is ready to be pulled into a plethora of different styles. Apply dry shampoo to the roots of the hair to create texture. Brush your hair into a high ponytail at the crown of the head. Secure your ponytail with an elastic band. Pull your ponytail through a hair doughnut so that the doughnut rests at the base of your ponytail. The doughnut helps provide shape and makes the creation of the bun more user-friendly. Splay your hair out so that it covers the donut going in all directions around. Wrap your hair around the doughnut, taking care to cover it completely. Bobby pin your hair in place as you go. Add a mist of hairspray to tame flyaways. Part your hair horizontally, starting at the mid ear and going to the other mid ear. Twist the top half of your hair into a bun and secure it with elastic to keep it in place. You'll want to leave the top half of your hair aside now so that you can style the bottom half first. Flip your head down so the bottom half of your hair falls over the front of the head. Holding your head upside down, take a substantial section of hair at the nape of the neck and split it into three separate sections. French braid your hair. To do this, create one braid by crossing your right section over your center and repeating with your left section. On your second braid, grab a new chunk of hair to the right of your right section before weaving it over the center section. Repeat on your left side. Continue this process until you've reached your horizontal part. Secure your braid at your horizontal part with an elastic band. You should now have hair that's French braided from the nape of the neck to your horizontal part. At the horizontal part, your French braid should be secured with an elastic band, leaving the remainder of your hair in a ponytail. Take your top clip out of your hair and pull your ponytail and top section into one ponytail that rests at the crown of your head. Use your hair doughnut to create a bun. Create a deep side part on one side of your head. The side does not matter. Pull your hair into a ponytail on the opposite side of your part. Your ponytail should rest at the nape of your neck. Twist your ponytail into a bun, using bobby pins to secure. Spritz hair with a holding spray to keep your bun in place. Blow dry your hair straight using a blow dryer and paddle brush. Create a deep side part on one side of your head. Apply styling gel to your hair from your edges to the tips of your strands. 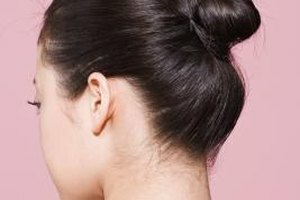 Brush your hair into a tight ponytail at the nape of the neck. Twist your ponytail around itself and into a bun, secure with bobby pins. Squeeze a dime-sized amount of shine serum onto your palm. Rub your hands together to warm the serum slightly and then run your hands over your hair, starting at your edges and going down to the nape of the neck. This will add an extra dose of shine. Gel doesn't just work for slicked-back styles -- If your tresses are especially unruly, apply a bit of styling gel to the edges of your hair and brush it in before creating your bun.